Click here to review responses by DC mayoral candidates to the Metro Washington Council's 2014 questionnaire. Click here to see how local labor-endorsed candidates did in the June 24 Maryland General Assembly and local primaries. (9/16/2014) The Metro Washington Council completed its endorsement process Monday night, endorsing a number of candidates in DC, Montgomery, Prince George's and Charles counties for the general elections in November. Click here for the complete final list of labor-endorsed candidates (including those previously endorsed). Click here to download the handy voting guide at right (which includes NoVA endorsements), suitable for distribution and posting on websites, social media, etc. DC: Atty General: Edward “Smitty” Smith; At-Large: Elissa Silverman and “No Position” (2nd At-Large City Council seat); Ward 1: Brianne Nadeau; Ward 3: No Recommendation; Ward 6: Charles Allen; ANC 4D-04: Donna Brockington (AFGE 32). The Board recommended No Position on the DC legalization of marijuana initiative. Montgomery County: For At-Large positions now occupied on the County Council by Nancy Floreen (No Recommendation), George Leventhal (No Endorsement) and Hans Reimer (No Endorsement). District 1: No Endorsement; District 2: No Recommendation; District 3: No Endorsement; District 4: Nancy Navarro. Sheriff: No Recommendation; Clerk of Court: No Recommendation; County Executive: No Recommendation. Charles County: County Commissioners: President: Peter Murphy; District 3: Amanda Stewart. 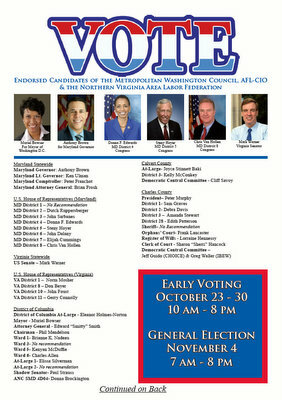 Democratic Central Committee: Dual endorsement for Jeff Guido (CHOICE) and Greg Waller (IBEW 1900).